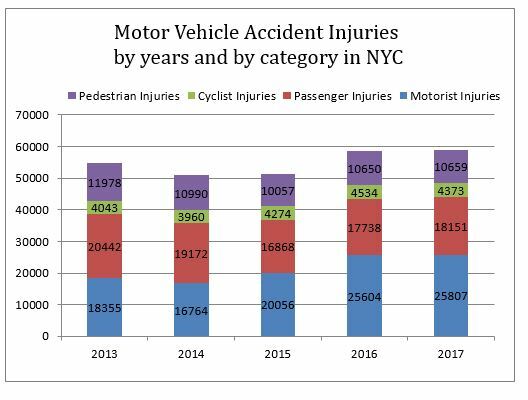 In 2017, 102 pedestrians, 20 cyclists, 24 passengers and 63 drivers died in auto accidents in New York City compared to respectively 134, 18, 17 and 54 in 2016. 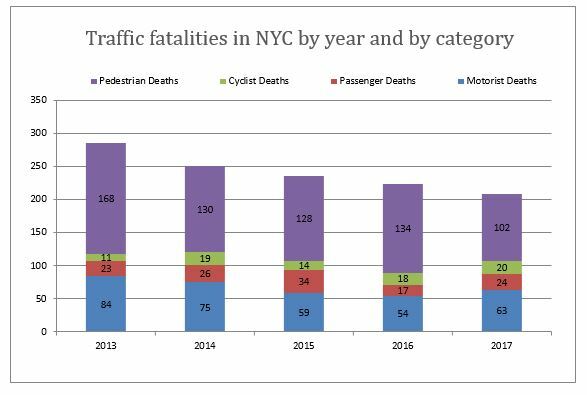 According to the traffic collision data released monthly by the NYPD, a total of 209 people died in traffic accidents in 2017 compared to a total of 223 in 2016 and 286 in 2013 before Vision Zero was launched. This is the lowest number of motor vehicle accident fatalities ever recorded since the city started to create statistics in 1910. The decline in traffic fatalities is mostly due to the decline in pedestrian deaths that went down by 39% from 168 in 2013 before Vision Zero to 102 in 2017. During that same time fatal bicycle accidents almost doubled going from 11 to 20. Passenger deaths stayed almost stable from 23 to 24 and motorists fatalities declined by 25%. Since Vision Zero started the main focus has been to protect pedestrians and after 4 years the results of the various initiatives are showing. More needs to be done to protect cyclists. The De Blasio administration is encouraging New Yorkers to use their bikes to commute to work however it is still dangerous to ride a bike in some areas of New York City especially during rush hour or at night. Another issue that needs to be addressed is distracted driving. Despite declining from 84 to 63 between 2013 and 2017, the number of motorists deaths was up by almost 17% from 2016 to 2017 and the number of passenger deaths increased by more than 41% during the same period. Distracted driving is the number one cause of accidents in New York City. Other road users at risk of accidents in New York, are bicyclists. Despite the construction of protected bike lanes all over the city, there are still areas and roads that are extremely dangerous for people using a bike to commute in the city. After jumping to 5,902 in 2016, the number of accidents declined by almost 6% between 2016 and 2017 to 5,565. The total number of bicycle accidents is still almost 8% higher in 2017 than where it was in 2013. It was at its lowest after the end of the first year of Vision Zero at 5,151. The number of injuries related to bicycle accidents follows the same pattern as the number of accidents. First declining fro 4,043 to 3,960 after the first year of Vision Zero, bicycle injuries then increased to 4,274 in 2015 and reached a peak at 4,534 before declining to 4,373 last year. Unfortunately the number of bicycle accident fatalities didn’t follow the same pattern. Last year 20 people died in bicycle accidents. This is the highest number of bicycle accident fatalities since Vision Zero started. Indeed there were less people dying in bicycle accidents before Vision Zero than after. 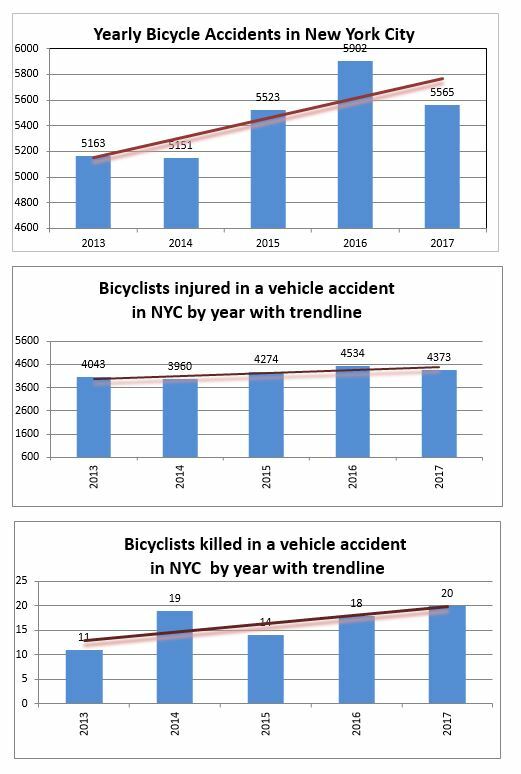 The number of deaths is obviously correlated to the increasing number of New Yorkers who are using a bike around the city. Mayor de Blasio has been pushing people to use healthy transportation modes to commute and reduce carbon emissions in the city. However if de Blasio wants a safe city for bicycle users much improvement still needs to be addressed. Anyone who ever tried to ride a bike in midtown Manhattan during rush hour would agree. Pedestrians were the main focus of Vision Zero and the results are showing that. Both pedestrian injuries and pedestrian deaths are on a declining trend since Vision Zero was launched. 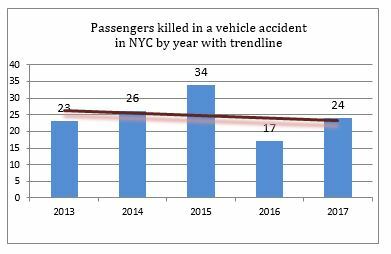 Pedestrians deaths recorded the most dramatic decline over the 4 years of the Vision Zero initiative. Between 20013 and 2017 they declined by 40% from 168 to 102. This is a historic record low for pedestrian deaths in New York City. 10,659 pedestrians were injured in car accidents last year in the city compared to 10,650 in 2016 and 10,057 in 2015. After decreasing from 11,978 in 2013 to 10,990 in 2014 and continuing to decrease in 2015 the pedestrian injuries increased again over the last two years. 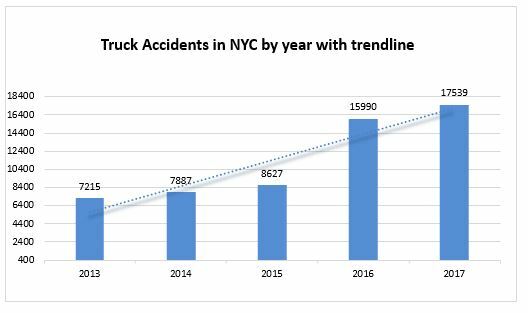 Another main concern for New Yorkers is the exponential number of truck accidents occurring in the city. Between 2016 and 2017 the number of truck accidents increased by 10% from 15,990 to 17,539. Since 2013 the number of truck accidents increased by 143%. These numbers are out of control and the city has to do something about it. 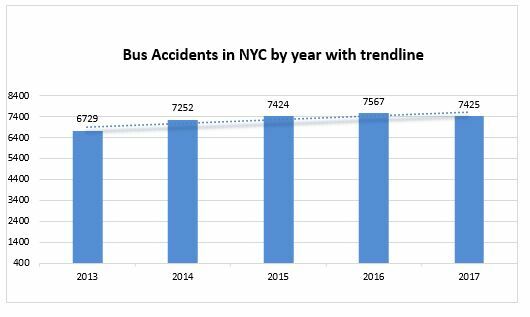 NYC Bus accidents slightly decreased last year from 7,567 in 2016 to 7,425 in 2016. However they are still on an increasing trend. Since 2013 the number of bus accidents increased by 10% in New York City.